News at Space For Arts - Page 3 of 5 - News from the best source to find a photo studio rental. The West Village studio was electric, with creativity buzzing among the 75 photographers, producers, writers, and art/creative directors who gathered to exchange ideas. Sally Singer, Vogue’s Creative Director, Digital led a discussion that inspired and enthralled. Leading up to our event with The Society of Publication Designers with Art Streiber and Michele Romero we were able to get some time with Michele to talk process. As the senior photo editor at Entertainment Weekly she is often charged with creating iconic cover images in short time frames. At Space for Arts we know that finding the perfect photo studio in New York or location in Los Angeles is just one part of the process. Sketching and reference have been essential tools for Michele, sparking collaboration and creative thinking at a weekly magazine —particularly in creating covers. Below she shares sketches and reference images for shoots with some of the most popular entertainment franchises out today including, The Walking Dead, Mr. Roboto, Stranger Things and Guardians of the Galaxy. Norman Reedus and Andrew Lincoln decimate a red velvet cake, defile a confetti gun for Art Streiber’s “Walking Dead” triple-cover shoot for Entertainment Weekly. Next Thursday 10.26 we are going deep into zombie land and beyond exploring Ideas, Process, and Collaboration with these two creative photo powerhouses. RSVP here on the Society of Publication Designers site. Thanks to Stockland Martel for the images. Photo by Art Streiber for Entertainment Weekly. Finding a great and affordable studio to shoot video in New York can be a challenge. At Space For Arts we have a wide selection of unique photo studios and locations, below are 10 of our best NYC studios for video (don’t miss our popular listing of 12 photo studios under $650 a day). We have included both clean white studios and spaces that border on locations with lots of character and natural environments. This spectacular Chelsea studio has high ceilings, huge windows, a skylight, a cyclorama, plenty of power, and state of the art EQ rental in house. It also has a removable wall for two medium size studios. For our second Pop-up collaboration, Space for Arts joined with The Society of Publication Designers at one of our favorite shooting kitchens. Photographer Noah Fecks and Food Stylist Victoria Granof spoke about their new personal collaboration Toast Water. It was a boisterous night discussing the sometimes beautiful sometimes hysterical Toast Water. Sometimes we need so inspiration to keep focused. We gathered a few of our favorite photographer quotes from four of our idols to keep us thinking and shooting. Make sure to visit Space for Arts we are adding new photo studios in New York and Los Angeles weekly. We’re fascinated by this new book from Langdon Clay. Cars were an indispensable aspect of twentieth‐century culture, both for their utility and aesthetics. 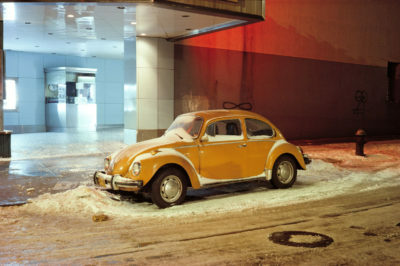 From 1974 to 1976, Langdon Clay photographed the cars he encountered while wandering the streets of New York City and nearby Hoboken, New Jersey at night. Shot in Kodachrome with a Leica and deftly lit with then new sodium vapor lights, the pictures feature a distinct array of makes and models set against the gritty details of their surrounding urban and architectural environments, and occasionally the ghostly presence of people. In the months after we launched we focused on NYC photo studios, but it’s been exciting over the last weeks to begin adding studios and locations in our second city, Los Angeles. Studios in L.A. are often much more affordable and because space isn’t such a premium we have discovered really unique large studios. At Space For Arts we have a wide selection of unique photo studios and locations. Below we have gathered 6 of our best Los Angeles studios, choose from spaces for $300 to $3,000 a day. 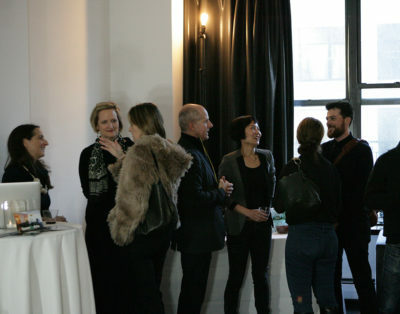 We held our first Pop-Up event collaboration with the Society of Publication Designers at this wonderful Meatpacking studio. Time Photography Director Kira Pollack shared her inspiration including the cinematic work of photojournalist James Nachtwey. Below are some shots from the first in what is sure to be an inspiring collaboration. Special thanks to our host Hyuna! 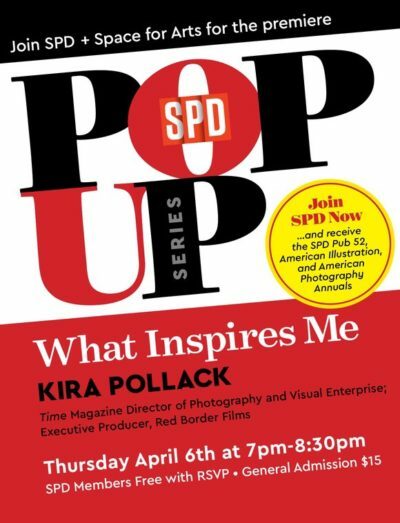 We are thrilled to have Kira Pollack from Time joining us for our first Pop-Up collaboration with The Society of Publication Designers. The talk will take place Thursday, April 6th at 7pm in a photo studio in the meatpacking district of Manhattan. You can RSVP here on the SPD website. Below she shares with Charlie Rose Time’s 100 Most Influential Photos of All Time project.